← Is Windows 8 Really As Bad As Everyone Says? Who Makes the Best 10” Tablet on Earth? This article has had over 16,000 views. Thanks for reading it. There have been lots of new tablets released since my last article, so I’ve decided to do an update. I started by evaluating all of the popular tablets, and then narrowed the list down to only eight finalists. Although there are some truly amazing 7” to 8.9” tablets out there, this article is only evaluating tablets that are 9.7” and larger. 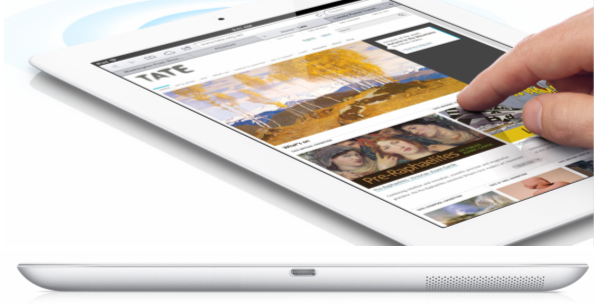 You can learn more about the new iPad mini and other smaller tablets here. This time I’m trying a new approach. Instead of giving my opinion, I’m going to provide the facts, and let you decide for yourself. If you think I’ve missed anything, please let me know in the comments section. This is a “living” article that will be updated as I come across new information. Make sure to check back to see what has changed. 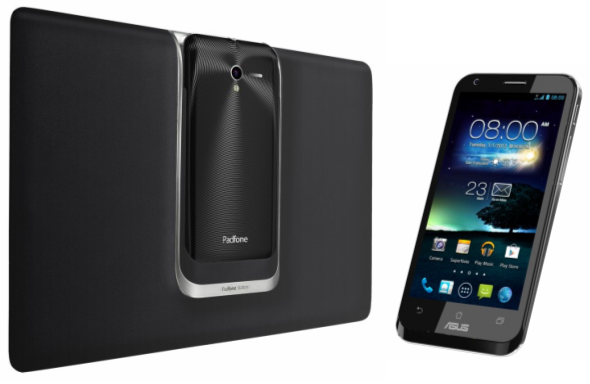 The ASUS PadFone2 is one of the most innovative mobile devices available today. Its Android-powered smartphone has amazing specs and a 13MP camera. The phones slides into a dock to become a tablet. The original ASUS Transformer Prime was the world’s first quad-core tablet. This Android-powered tablet been upgraded to a 1920p HD display and has an excellent optional keyboard dock. Some reviewers believe this is the best tablet available today. 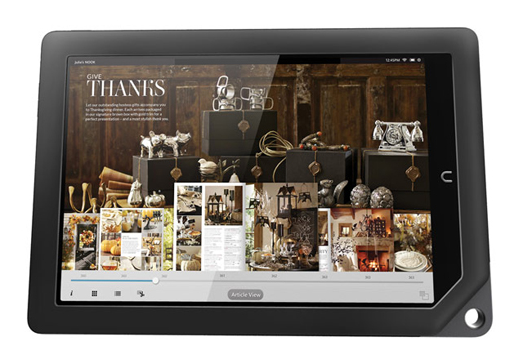 Barnes’s and Noble’s Nook HD+ is the the world’s first 9.0″ tablet. It’s very light and costs less than any other tablet here (pricing starts at $269). This is a pure e-reader without extras like cameras, GPS and cellular capabilities. 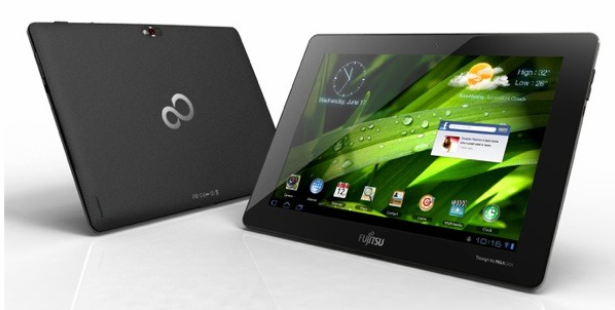 The Fujitsu Stylistic M532 is a business-ready Android tablet. It has a fast quad-core processor and is thin, light and durable. 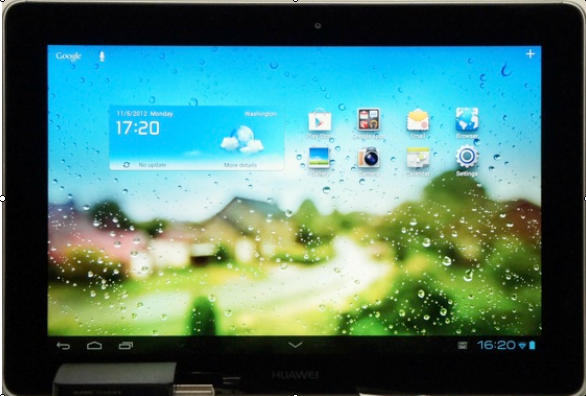 The Huawei MediaPad 10 is a 10 inch Android tablet with a quad-core CPU and optional LTE support. Currently it’s only available in Europe. Currently not available in the U.S. 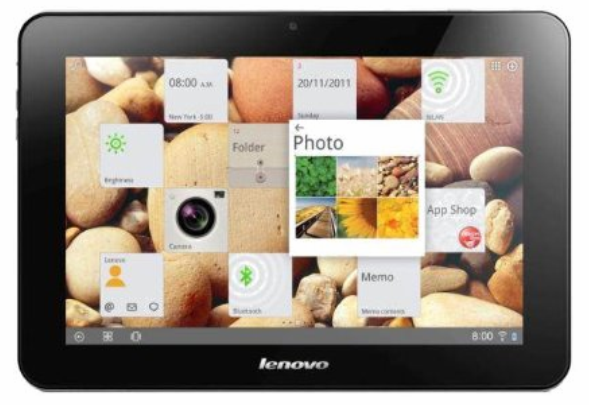 The IdeaTab S2110 is a 10/1″ Android-powered tablet from Lenovo with 3G connectivity and a built-in FM radio. 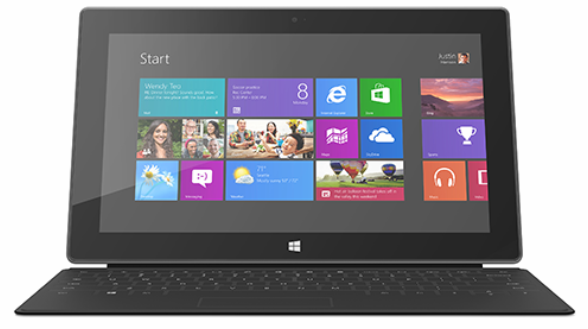 The Microsoft Surface RT is the most affordable Windows 8 tablet available today ($499). It runs Microsoft’s new Windows 8 Operating system and comes preloaded with a full-version of Microsoft Office. Looking for a good collection of Microsoft Surface RT hardware reviews?. 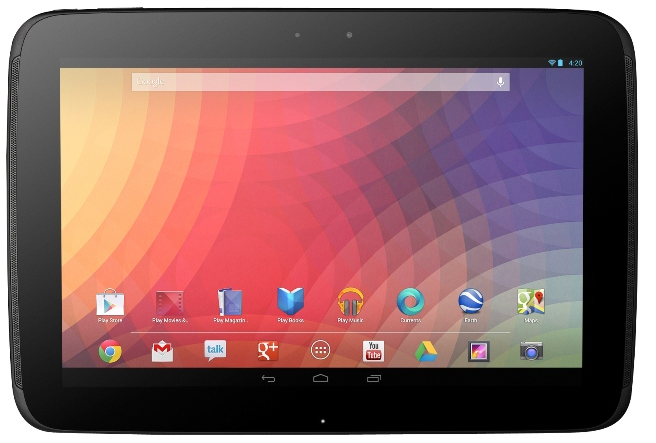 The Google Nexus 10 is an Android tablet which has a Samsung Exynos 5250 processor clocked at 1.7 GHz. It’s a dual-core Cortex-A15 chip that performs well in benchmark tests. Central to the speed of the Exynos 5 Dual is the ARM Mali-T604 graphics processor, which more than doubles the 3D performance of the already fast Samsung Galaxy S III’s chip. But the biggest standout in the Nexus 10 is its beautiful 2560×1600-pixel display. 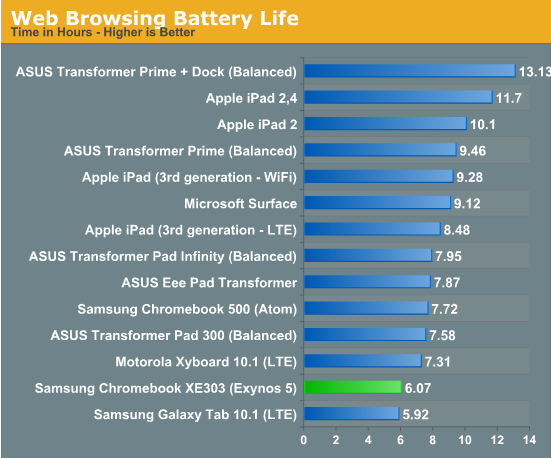 First tablet with an Exynos 5 ARM Cortex-A15 processor that beats the Tegra 3 in benchmarks. First tablet with multi-user support which allows you to set up a guest profile so someone can check their email but can’t update your Facebook status. Also allows different family members to have there own spaces and apps. The new Android 4.2 Gallery app has been improved so you can now tweak your photos like pro software. Has Google Wallet preloaded. Allows you to purchase things with your tablet. Fast and smooth scrolling. The entire user interface runs at 60fps. Camera is only 5MP. Other tablets have 8MP and 13MP cameras. More Nexus issues listed under my first impressions article and a second article. Update: The Nexus 10 went on sale on November 13th and the 32GB model sold out within two hours. Since then, Google has gotten more in. What about the build-quality of the Nexus 10? Click here, and scroll down to the bottom of the article. The Galaxy Note 10.1 is the only tablet here with full stylus support including pressure sensitivity. 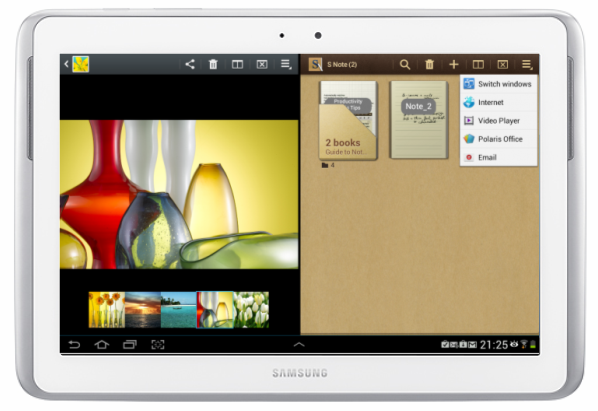 This Android-powered tablet also has the ability to split the screen in two and run two apps at once. 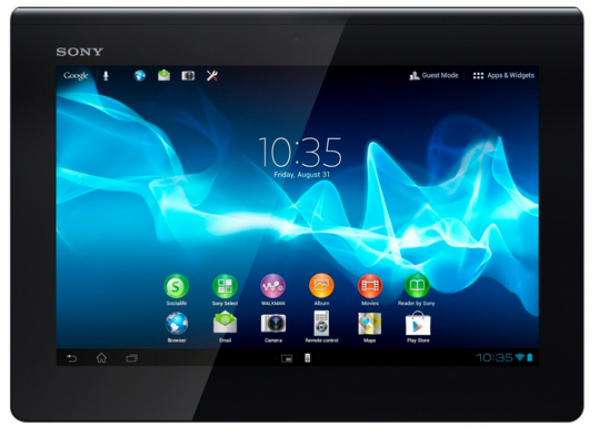 The Sony Experia is the lightest tablet here. This Android-powered tablet has a fast quad-core processor and built-in infrared transmitter. That’s it! Now it’s up to you to select the best tablet based on your needs. Let me know which one you decide to buy and why. P.S. Because I’m starting to get some stupid comments from Apple fan-boys, I’m going to give you a little background: Before anyone accuses me of being an Android fan-boy, you should know that almost all of this article was written on an iPad 3, which I like very much. I write very opinionated articles about all platforms. My previous post was about Windows 8 tablets. One of my most popular posts slams Samsung and Google about beaming. I was also an iPhone user for three years and think Apple TV is a great product. Some of the new Apple products look very appealing to me, but sadly the iPad 4 is not one of them. I’ve listed everything good and bad I can find about every tablet here and I’m continually updating this post as I find more stuff. Make sure to check back later to see how this article evolves. There are a few new tablets that have come out since I wrote this. Although I haven’t had time to add them yet, you can read about them in the Comments section of this article. Thanks for making this my most popular post ever! This post received more views on 10/30 than any other post I’ve even made. I never thought it was possible to get this many views in a single day. Thanks everyone! Copyright 2013 Rick Schwartz. All rights reserved. Linking to this article is encouraged. Rick Schwartz is blogger from San Diego. You can learn more about Rick by clicking on the "About" tab at the top of mostly-tech.com. 39 Responses to Who Makes the Best 10” Tablet on Earth? Great suggestion. I’ll look at that and add it if it competes with the tablets I have here. Let me know if see you other omissions. Thanks. I finally got time to add this. Let me know if you see any errors. Thanks again for the suggestion. “Released back in July, so it’s not using the newest technologies” Krait processor is pretty new, don’t you think? Pricewise, Lenovo is known for having periodic sales, and especially good employee pricing for various companies. I agree the Krait processor rocks. I wasn’t referring to that, but since you found that confusing, I’ll delete that comment. I agree that Lenovo tablet is a good value, and mentioned the price in my article. Congrats Rick, outstanding article but missing Five categories in your chart table : OS VERSION, Output & Input Jacks (USB type, Dock connector, HDMI, Headphone etc. ), Buttons (Menu, Volumes, Mute etc.) , Manual Attach – Detach Keybord : Yes / No. Performances: Browsing, Video Games, Hd Video, Audio, Video Chat, Facebook Chat. Please update / include it in your table. Thanks. I have some of that info, but the chart is too large already, and as a result hard to read due to the small font. Rick, this is a quick note to thank you for your fantastic blog! I discovered it yesterday and, frankly, can’t tell why I didn;’t notice it earlier. Keep up the good work! Thank you so much. Your kind words mean a lot. 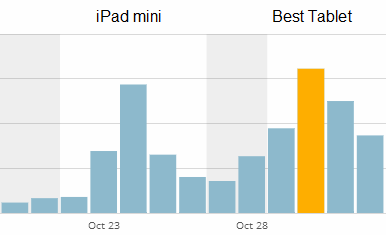 I don’t know why, but in the past few weeks the traffic I’m getting has just exploded! Hopefully it continues. Rick, having seen and subscribed to dozens of blogs and having been involved in blogging myself, I can assert that it’s because you churn out some of the best articles in the arena of Android, iOS and Windows. Your blog is now in my list of RSS feeds! As I’ll be switching from iOS to Android (that’ll most probably be from iPhone 4S to Galaxy Note II), I guess I’ll have to stick to your articles. How exactly is the lack of a quad core processor a downside to the N10? It uses a new CPU and GPU and is faster than any other mobie device on the planet! Thanks for the comment. Quad-core processors multitask better (when you’re running threaded apps). I agree that quad-core CPUs aren’t slower and often perform better on real-world tasks. I agree it’s not a major disadvantage, but I’m trying to be fair and list all potential disadvantages that I’m aware of. Is the absence of physical home button a weakness? I’ve needed that button and my gues was its presence should be a weakness as it wears out quickly! I didn’t used to think it was important, but after owning one phone w/o it (e.g. Galaxy Nexus) and another with (GS3), now I think it’s important. I also recently played with a Windows 8 tablet with a flaky home button which drove me crazy because I had to hit it several times to get it to respond. Lastly on some devices, having a physical home button saves you screen real estate. It’s not a major thing however, which is why I placed that near the bottom of most of the tablets. Thanks for the comment. You seem to know nothing whatsoever about CPUs on GPUs when you point drawbacks such as “no quad core cpu and only quad core graphics” on the iPad. It is well documented and tested that the A6, let alone A6X wipes the floor with EVERY other SOC. “The SoC is the long awaited Exynos 5 Dual, the first with ARM’s Cortex-A15 cores, and Mali-T604 GPU. Anand’s been chugging away at the review for the most recent Chromebook, the first device to feature the Exynos 5 Dual, and will dig deep into the performance of the hardware, so we’ll save plenty for that. I will mention again, though, that one of the key features of the SoC is the enormous memory bandwidth. When Apple introduced the Retina display on the iPad (early 2012) we explored the importance of memory bandwidth to be able to generate all those pixels at a high frame rate. For Apple the solution in the A5X was to develop a configuration of four 32-bit channels connected to LP-DDR2 memory with a 400 MHz clock. The resulting bandwidth was an impressive 12.8 GB/s. The Exynos 5 Dual matches that figure, but does so with half the channels at twice the clocks while utilizing low-voltage DDR3 memory (2x32bit @800 MHz). You can count on that! It’s amazing how irrational the fan boys are on both sides of the aisles. Well researched article, Thank you very much for your hard work. You are pointing out right facts without fanboism…. you missed to mention that the Samsung note 10.1 has a unique feature , it works as a GSM phone as well. sends/Recieves SMS as well. which makes it similar to the Asus PadPhone 2.
another thing , you totally missed the Samsung ativ Smart PC Tablet with full Digitizer pen … and it has the same S pen and S note found on the Samsung note 10.1.. and they run native wind 8 programs and work for 9 hours !!! a clear winner. I think Windows RT tablets are waste of time and money , since standard Atom based Tablets work for 9 hours and standard programs will work . the AMDZ-60 Cpu also kicks in … which has DX11 GPU and takes 4G ram. I think the Fujitsu Stylistic Q572 has em. The Asus Vivo Tabs are cool too. (both win8 RT and standard win 8) and are like the transformer. Great comments SNA. I’ll try to incorporate some of these into my article. Thanks for sharing. I’ll take a look and consider that for my next tablet review. they are really fully loaded. 9- DX11 graphics on AMD (HD6250) also uniqe in the Atom and ARM class. 10- TRUE mSATA 3 6GB/s SSD (atoms and ARM use emmc). and REALLY a LAN PORT on TABLET ! I LOVE it ! I guess for Atom/ARM level win 8 tablets we have a winner here … they cant offer the DX11 graphics and 4G of Ram the AMD Z-60 can do , plus the Amazing specs of this tablet. I hope the price is good. It’s good to see more tablets with removable batteries and other innovative features. I’ll add one of these to my next tablet update as well. In the meantime, I added a line to the article telling people about these, and suggesting that they check the comments section for more info. Please keep on adding details about new tablets here and I will give you special credit in my next tablet update. Thanks a lot Rick – for this GREAT COMPARISON !!! I’m looking for a new tablet and it really helps. 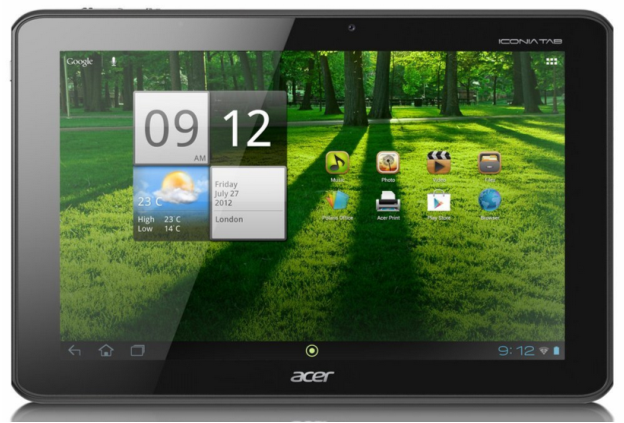 I will not spam you with suggestions, but I think the Acer Iconia is worth a look…? Good suggestion Frank. I’ll add that today. Please let me know if you think I missed any important pros or cons for it. Thanks – for including the Acer Iconia ! Over all, it seems to be the best solution (at the moment) with the fewest drawbacks. Thanks -again- for this Comparison !!! You’re welcome. Thanks for the suggestion. Anyway … maybe it would fit good into your comparison ….? I’ll look into adding that later. Good question. There are a large number of good Android security apps, but I don’t know any one who uses any of them. You’d have a hard time finding someone who’s been hit by Android malware on an app downloaded from Google Play. This risk is extremely small. Other than that though, a very fair comparison. Asus MemoPad 10 (ME301T)? Kindle HD 8.9? When you say “iOS apps are less likely to contain malware than Android apps”, are you referring to sideloaded apps? Both Apple and Google have had few instances of malware showing up in their respective stores. Sideloading is not possible on either system by default, and if the user chooses to do so on android he is warned. In the latest versions of Android, sideloaded apps can be scanned. IMO, this is at least a wash, perhaps with points to Google for letting people have an informed choice. Your comments are all valid. Although it’s true both stores have had malware, there is evidence Google has had more. how bout asus memo pad smart 10?